“The Camino Made Easy: Reflections of a Parador Pilgrim: Three Walking Tours on the Way of St. James through Spain and Portugal to Santiago de Compostela and Finisterre” (published by Archway Press) by Olivia Pittet is a personal and practical narrative that considers the cultural history, spiritual diversity and medieval legacy of the Camino, also known as the Way of St. James, through a modern-day walker’s lens. The book is available for purchase at: https://www.amazon.com/Camino-Made-Easy-Reflections-Compostela/dp/1480863475. Revealing the Camino’s physical challenges and its opportunities for personal growth, Pittet testifies to the practical advantages and relative ease of doing this increasingly popular long-distance medieval pilgrimage trail as part of a van-supported and guided small-group cultural walking tour. And by highlighting the Camino’s historical background, taking a fresh look at its ancient legends, and telling Chaucer-style tales about herself and the people she meets, Pittet recreates the Camino anew for pilgrims and tourists alike. Olivia Pittet was born in England and immigrated to America in 1963. She received her Bachelor of Arts from London University and her master’s degree in English and comparative literature from Columbia University, specializing in medieval studies. Now a freelance editor, she previously worked for many years in book publishing. Pittet is also a dedicated walker who has taken walking tours throughout Europe and North America for over 20 years, on one of which she met her present husband. 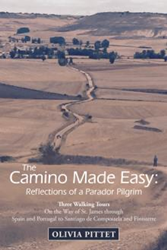 “The Camino Made Easy: Reflections of a Parador Pilgrim,” Pittet’s first book, was written — and walked — while the author was in her 70s.